Black Friday is almost here, so make sure you’ve got the tools to score the best deals around this holiday season. We’ve done the leg work for you and found 5 of the top shopping apps. All you have to do is download them, and get shopping! Red Laser helps you shop smarter by finding the best deals near you. Just scan an item you’re interested in using the built in QR scanner and the app will locate the closest retailer or if you prefer, an online store, at the lowest price. Personalize the app by storing your rewards cards and favorite shops or products to tailor your searches. The app even lets you compare prices across several stores, taking all the guess work out of your Black Friday shopping. Not sure if you can get it cheaper at Target? Red Laser lets you know quickly so you don’t lose your spot in line. Black Friday app is your perfect shopping companion this year. This app scours the internet to round up the latest deals and coupons, collecting them in one place so it’s easy to score the best prices for all the gifts on your list. You can sort through the deals by store or category and get real time updates when new deals are rolled out. Download the app ahead of time to create your shopping lists and set your budget with the built in calculator. You can then share your list with friends and family- helping you divide and conquer. The best part? The information downloaded through this app is available offline so you don’t burn through your data plan in stores without WiFi. Coupon Sherpa was the first coupon app and still remains a top choice among shoppers. This app collects hundreds of coupons from popular retailers, even restaurants, and puts them right at your fingertips on your cellphone. Users can browse the deals by store or category and choose to save them in the app, or print them off and take a hard copy to the stores. This app is great all year long, but its special categories for Black Friday, Cyber Monday and the holidays make it great for tackling your shopping list this holiday season. Savvy shoppers know the importance of packing light on major shopping excursions, and Black Friday is no exception. Key Ring lets you consolidate all your loyalty cards, rewards punch cards and exclusive coupons in one place on your phone so you’re never without them, and your wallet is lighter. No more digging through your bag for that rewards card to get your 10% off. Just scan all your cards into the app and it all stays on your phone. It can’t get much easier than that. Hukkster is the deal finders dream come true. The app tells you when your favorite products go on sale so you get the cheapest deal possible. Just browse the stores you like online, “hukk” your favorite items (which saves them to your list) and the app will notify you when the items you’ve saved go on sale. Hukkster shows up as a button on your browser so it’s always there when you want it and allows you to compare prices across several stores. Set alerts for items on your loved ones’ lists and give a gift you know you’ll love without breaking the bank. 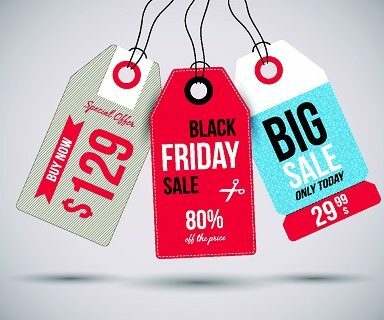 What are your favorite Black Friday shopping apps? Let us know below.